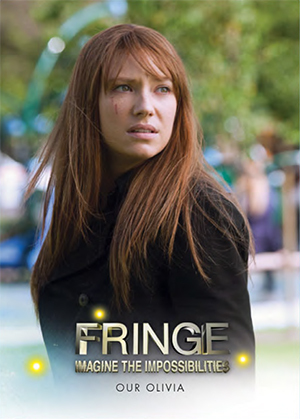 2013 Cryptozoic Fringe Seasons 3 and 4 goes deeper down the rabbit hole of the popular science fiction show. The show's second set maintains many of the similar elements of the first, including autographs and costume cards. 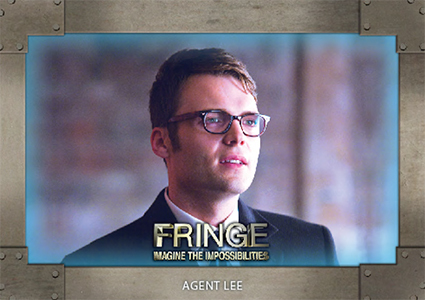 A total of 72 cards make up the 2013 Cryptozoic Fringe Seasons 3 and 4 base set. Cards retell key points in the series, which stars Anna Torv, Joshua Jackson and John Noble. With two universes now firmly established by the show, these seasons focus on the ongoing conflicts between the two. Behind the Secens and The Other Side make up the set's basic inserts. Both have nine cards and fall 1:12 packs. Autographs and Wardrobe Cards are bother inserted one per box. Signers for the set include Anna Torv (Olivia), John Noble (Walter), Blair Brown (Nina), Jasika Nicole (Astrid) and Star Trek legend, Leonard Nimoy. 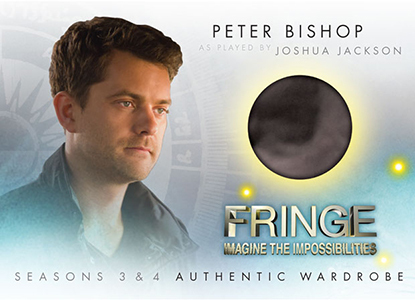 The 2013 Cryptozoic Fringe Seasons 3 and 4 special redemption is for an over-sized costume card with six costume swatches. Measuring 4" by 6", the redemption is limited to 25 copies. Sold separately, the set's binder has an exclusive costume card. Inserted 1:24 packs. A2 does not exist. Click here for a complete visual guide to the set. Good: Several key stars on autograph checklist, Wardrobe Cards include only main characters, clear images on base cards. Bad: Lack of inspiring inserts, break is somewhat bland as majority of packs only have base cards. 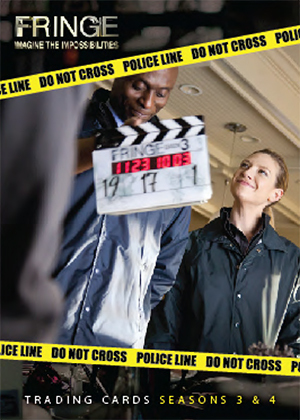 The Bottom Line: 2013 Cryptozoic Fringe Seasons 3 & 4 does a good job of covering the middle part of the series. 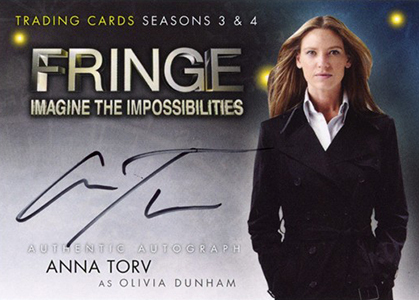 It also gives collectors a second chance at autographs from top actors like Anna Torv and John Noble. But at the same time, it's not very exciting. From pack to pack, there's little variety as the inserts are relatively few. On top of that, they don't show nearly as much imagination as the TV series does. Unlike a lot of sets based on TV shows and movies, Fringe Seasons 3 & 4 has stellar images throughout. They're all sharp, focusing on the characters. This might seem like a given, but you might be surprised how many sets arrive with grainy and blurry shots. Inserts are a little more of a mixed bag. Autographs are on-card, a major plus. The Wardrobe Cards are my favourite in the release. They offer a nice balance of images, color and white space. The basic inserts are something of a disappointment. Behind the Scenes has a different look and unseen shots, but they're not enhanced in any way. The Other Side uses foil so they look different. Again, though, they lack a sense of being truly special. Like the first Fringe set, Seasons 3 & 4 does a great job with the autographs. While there's no Joshua Jackson this time, there is small screen legend Leonard Nimoy. Most of the big names have signed before, but they were extremely tough to find. The Wardrobe Card checklist is large and focuses only on key characters. So even if you land a lesser signature, you should find a big card that focuses on a central player. Yes, you're going to get a base set. There's also the autograph and costume card, which can be hit or miss. But there's not much else. With so many packs that just have base cards, it means two things: lots of duplicates and an added reliance of which hits you get. Even if the number of insert sets doesn't change, it'd make a big difference if they used a different type of technology like lenticular cards to flip between the show's two universes. It was tough to get really excited about Fringe Seasons 3 and 4. It covers the show just fine and offers a chance at some great signatures. But that's about it. The lack of variety over the course of a box definitely hurts. As a result, the appeal is likely going to be for the show's die-hard fans, more so than the usual entertainment trading card set.